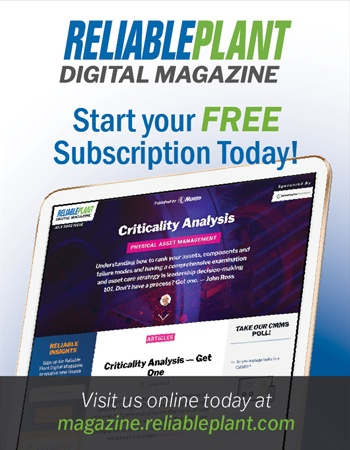 The current crop of predictive maintenance (PdM) management software now delivers instantaneous decision-making power for those engineers and plant managers charged with wringing the maximum utility from their facilities while conserving maintenance costs. Capable of instantly analyzing and interpreting vibration data – along with ferrography, used-lubricant analysis and visual inspections – today’s PdM software not only delivers integrated and prioritized information to plant managers in their offices, but throughout the entire organization via enterprise-wide “electronic in-trays,” text messages, pager alerts and even HTML pages accessible via a common Web browser. Predicting the repair needs of critical components in lathes, mills, turbines, fans, drills, pumps and any other rotating device allows today’s MRO executives to control the destiny of their plant’s operations by preventing unexpected shutdowns in the first place. This ability to plan for the future is no longer the domain of Fortune 500 companies, as PdM software’s power to deliver answers, not merely data, has even trickled down to small and mid-sized businesses. However, it wasn’t always that way. It wasn’t that long ago that plant engineers relied on run-to-fail (RTF) maintenance schedules – a method that almost guaranteed unscheduled process line shutdowns. Hardly satisfactory, the maintenance industry welcomed advances in computerization as a means to help prevent expensive machine breakdowns. Even the private sector “made do” with rudimentary results while absorbing huge manpower expenses. Automakers and power companies, for example, would maintain vast banks of vibration experts for the sole purpose of tracking machine life. Perhaps the persistent vision of massive mainframes crunching data from cumbersome Winchester drives possibly accounts for the reluctance of some individuals to believe that today’s basic PdM software can run on nothing more than a first-generation Pentium desktop computer. Yet, given the comparative low cost of entry and the gains to be had, maintenance managers of even small manufacturing facilities are now turning to full-featured PdM systems. Such are the advances that have been made over the past couple of years. Overly cautious, prevention-minded systems of the last decade wasted valuable maintenance resources by manually analyzing each piece of new data, whether the machines needed attention or not. As an example: Some 30 years after its initial work for the Navy, Azima DLI deployed its expert system of PdM software to analyze data for thousands of machines within the U.S. Navy Sealift Command. A subsequent study of 332 such machines confirmed savings of between $47,000 and $62,000 per month, as opposed to manually calculating the data with in-house engineers. The accuracy rate proved to be 8 percent greater with the PdM system, as well. Spectacular gains in maintenance efficiency and dollar savings have resulted from integrating modern PdM systems into existing facilities. Yet, the use of PdM to predict the useful life of brand newmachines promises to save organizations even more money. In recent years, DaimlerChrysler’s Toledo North assembly plant avoided costly downtime by accurately predicting maintenance failures in newly purchased equipment. Kulczak explains that his team used their PdM system to evaluate more than 600 pieces of new equipment such as regenerative thermal oxidizer motors, water pumps, cooling fans and gearboxes. At least 106 pieces of equipment needed adjustment or new parts. In his report to management, Kulczak estimated that the maintenance costs to repair these defects – had they not been detected in advance – would amount to at least $31,000, with a possible maximum cost of $112,000. Production losses due to failed machinery would have resulted in even greater losses to the plant’s bottom line. The above-mentioned, bottom-line savings earned by investments in maintenance management have occurred through the continuous evolution of each element of the PdM chain. Progress has been achieved at every step, beginning with technological advances in field instrumentation that measures torsional vibration, torque and horsepower, motor current, structural vibration, shaft alignment, and acoustics with every increasing accuracy and fidelity. Even more important, an emphasis on portability has placed condition monitoring into the hands, literally, of production floor personnel. As proof, Azima DLI’s DCX pen-tablet handheld computer can host a replica of an entire condition monitoring database – capabilities previously reserved only for high-end desktops. With analysis tools and automated diagnostics onboard, the user enjoys a tremendous advantage in obtaining immediate answers while in the field. “With today’s versatile and portable data collection systems, we’re basically doing EKGs on machines,” notes Lofall. “Just like when you go to the doctor, an EKG will detect any early problems. Similarly, machines will give off precursors, or early indicators, of future problems. 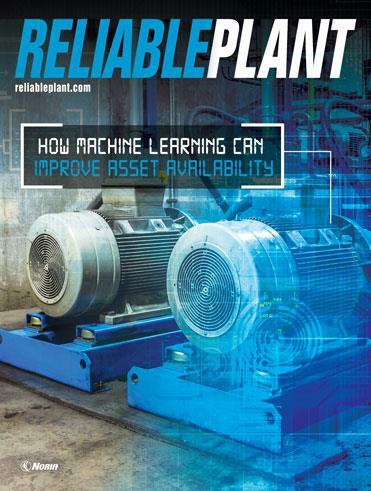 The next-greatest boon for plant managers can be attributed to the manner in which this data is now processed with almost real-time speed to deliver intelligent answers regarding machine condition. For instance, Azima DLI’s vibration analysis software uses an empirical, rule-based logic system that utilizes order-normalized data, spectrum analysis, cepstrum analysis, demodulated data analysis, and other proprietary algorithms to deliver information with an emphasis on providing a straightforward user interface. All data and functions are made available from a single-layer intuitive screen that is quickly organized via a built-in setup wizard. The real dollars-and-cents gains of utilizing PdM software come from employing these systems to continuously evaluate machine conditions. While maintenance success stories rely on ever-more powerful data collection and process tools, the breakthrough benefits result from the integration of this important maintenance data into one seamless source of concise information. For example, Azima DLI’s Voyager is an integrated environment that combines vibration analysis, used-lubricant analysis, infrared thermography libraries and even visual inspections (input via portable data collection instruments) to provide a single view of the maintenance status of a plant’s machinery. By utilizing one common platform to combine and compare various data sources, a cross-technology scoring can be achieved. This yields a prioritized ranking so that facility managers can schedule plant-wide repairs in order of urgency. Reports can be customized to include detailed plots and images to justify comprehensive, program-management decisions. Integration of PdM software recently proved itself at Tri-State Generation & Transmission’s Escalante generation station. Azima’s vibration diagnostic software, ExpertALERT for Voyager (EAV), recently saved Tri-State money by taking machines out of service for necessary repairs based on their condition instead of waiting until they fail, but it was the thorough dissemination of this information that helped make the program a success, according to Joe DeSoto, a results specialist at Tri-State. DeSoto stresses that providing such information on the production floor is crucial to gaining the confidence of the maintenance staff. Showing them ExpertALERT’s diagnostic capabilities in action helped develop trust in the tool throughout the facility and boosted the credibility of the entire PdM program. In essence, the latest PdM communication tools excel at “bringing the mountain to Mohammed” by abstracting data from insular condition monitoring applications, and then placing it at the feet of maintenance decision-makers. For instance, in conjunction with diagnostic software, Azima DLI’s online software permits facility managers to ascertain the status of wired machinery simply by logging onto their network to view real-time vibration data or obtain a complete diagnostic analysis. Under such topology, the online system is simply another node on the plant’s LAN. An Active-X component can even be installed on selected computers so that maintenance alert messages automatically pop-up on the screen. Additionally, electronic “in-trays” can be configured so that only the status of critical, process machines will be delivered to the user. Taking things a step further, Azima DLI offers a unique means of distributing maintenance information by automatically generating machine status summaries in HTML, so that these pages can be accessed via a common Web browser. This allows a traveling engineer to determine machine status, even from outside the company WAN. Modern PdM communication software also allows a significant amount of customization. These improvements in communication are even becoming available to small organizations that lack integrated business systems. Azima DLI, for instance, operates an online monitoring center on a 24/7 basis, providing worldwide coverage of wired machines. The monitoring program can be set up to deliver maintenance information over a wide range of time frames, from monthly reports all the way to immediate-alert messages. And so, the story of PdM has come a long way from the early days of RTF. Innovative PdM tools now help engineers accurately track the condition of their assets, whether they’re using a stand-alone PC system in a small job shop or an enterprise-wide system for a multi-plant industry. Because today’s modern PdM systems enable increased uptime, energy savings, and reduced maintenance costs for organizations of all sizes, it has earned recognition as a contributor to profitability. Those plant engineers who have taken the next step from time-based or reactive drills to proactive condition-based planning on both existing and newequipment, are laying the groundwork for even further advances within the field of maintenance management. For more information about Azima DLI and its line of predictive maintenance products and services, visit www.azimadli.com or call 800-482-2290.